Grapevine leafroll-associated viruses (GLRaV) are a significant problem for grape growing regions worldwide. GLRaV is an issue for both wine and table grapes as it causes yield loss (up to 50%) and delayed or variable ripening, impacting on timing of harvest and grape quality. In Western Australia, GLRaV 1, 2, 3, 4, 5 and 9 are present however GLRaV 1 and 3 are the most common. GLRaV symptoms can be confused with several other disorders or natural physiology characteristics of grapevines. Grapevine leafroll-associated viruses (GLRaV) are a significant problem for grape growing regions worldwide. They are the most common grapevine viruses present in Australia. Infected vines may not show immediate visual symptoms or yield loss and the virus infection can go unnoticed. This leads to more significant problems as the infected vines mature. GLRaV is an issue for both wine and table grapes as it causes yield loss (up to 50%) and delayed or variable ripening, impacting on timing of harvest and grape quality. GLRaV infection can also cause graft incompatibility resulting in high mortality in nurseries and vineyards. The disease is caused by a number of different viruses belonging to the same virus family (Closteroviridae). They can only be differentiated by molecular or serological tests. In WA, GLRaV 1, 2, 3, 4, 5 and 9 are present however GLRaV 1 and 3 are the most common. Despite the potential for yield loss some wines with desirable characteristics are made from vines known to be infected with GLRaV in WA. Vitis vinifera (grape varieties/cultivars) are all susceptible to infection although cultivars and clones differ in their symptom expression. Rootstocks, which are derived from other Vitis or related species, can differ in their symptom expression, with some remaining symptomless. One of the issues in identifying virus infection is the variability in symptom expression. Environmental conditions, virus strain variation and cultivar susceptibility can create differences in symptom appearance. It can also take several years from the initial infection event before infected vines show visual symptoms and they may not be seen every season. The most obvious symptom of a GLRaV-infected vine is that the leaves roll downwards at the margins during late summer and autumn (Figure 1). Leaves can change colour, being red-purple for red and black varieties or yellow for white varieties, whilst the area around the veins remains green (Figures 2 and 3). Mature leaves (those lower on the shoots) are the first to show symptoms of infection. Infected vines have less vigour than healthy vines but this can be difficult to detect in situations where many vines in the block or the whole block of vines could be infected with virus making comparison difficult. Bunches from infected vines take longer to ripen than those of healthy vines, sometimes this can be up to a four week delay. Berry colour can be uneven or reduced, in red and black cultivars. During the growing season leaf symptoms appear prior to berry symptoms. When am I likely to see GLRaV? 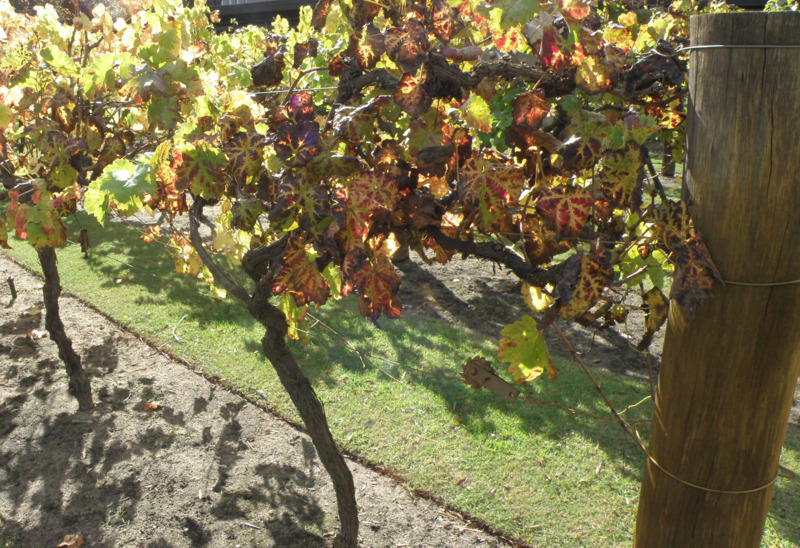 During the post-harvest autumn period, when leaves begin to change colour, is the most likely time to see virus-infected vines (Figures 4,5,6). During winter, infected vines will retain leaves whilst leaves on healthy vines will have dropped (Figure 7). GLRaV symptoms can be confused with several other disorders or natural physiology characteristics of grapevines. Some red and black cultivars have leaves that turn red-purple in autumn, one in particular is the glory vine that naturally changes colour in autumn (Figure 8) and another is a table grape cultivar (Figure 9). However these vines do not exhibit leaf rolling and will drop their leaves early in winter. Nutrient deficiencies, particularly phosphorus, zinc, magnesium, potassium and iron, can cause symptoms which may look like GLRaV (Figures 10 and 11). These symptoms are likely to appear any time during the growing season and would not appear with leaf rolling. Six-spotted mite infestation can cause symptoms on vines that could be confused with GLRaV infection. Six-spotted mite is located sporadically in some south-west vineyards. The signs of feeding by the mite differ from symptoms of GLRaV because the mite causes early defoliation of vines (Figure 12). Also, mite feeding is initially restricted to areas adjacent to the leaf veins rather than in the middle of the leaf, essentially the opposite of a GLRaV infection (Figure 13 and 14). If the presence of six-spotted mite is suspected as the cause of leaf doscolouration or leaf fall, checking the underside of leaves adjacent to veins will confirm whether the mite is present. Refer to the six-spotted mite page for more information on this pest Six-spotted mite - a pest of grapevines and avocados. Initial introduction of GLRaV to a vineyard usually occurs through infected propagation material or via budding and grafting and accounts for the movement of the virus over large areas. Insect vectors such as mealybug and scale have the ability to vector the virus but spread is generally localised within a vineyard. Transmission via roots has also been recorded to occur so the disease can spread along vineyard rows as roots from different plants can graft together. What do I do if I suspect my vines have GLRaV? If you suspect your grapevines may be infected with GLRaV samples should be sent to the Department of Primary Industries and Regional Development's Diagnostic Laboratory Services (DDLS) for accurate diagnosis. Testing can differentiate which of the GLRaVs have infected your vines. Sample forms and sampling procedures are available from DDLS - Plant pathology services. There are no curative management options for GLRaV besides removal of the infected vines. Removal of vines should include as much of the root structure as possible. If you were to plant immediately after removal and vine fragments remained with virus this could transmit to the newly planted vine. It is recommended to leave the land fallow for at least 9-12 months prior to replanting. When sourcing planting material for a new vineyard ensure the cuttings or rootlings are sourced from an accredited certification scheme or from plantings that have been tested regularly for GLRaV and shown to be free of the virus. Managing vectors in mealybug and scale can help to reduce the ongoing spread of GLRaV within your vineyard. For more information refer to Aphids, mealybugs and scales.